Women can save the world. More than 50 incredible female super heroes from the Marvel Comics universe inspire girls and women of all ages to be powerful, passionate, and persistent. From Captain Marvel and Wasp to Storm and Shuri, this beautiful book profiles dozens of aspirational female comic-book characters, all of whom use their intelligence, strength, kindness, and courage to help others and save the world. Fierce fan-favorites such as Gamora, Squirrel Girl, and Black Widow feature alongside lesser known faces from all corners of the Marvel comic-book universe. Young girls will discover modern, diverse heroes they can relate to and look up to, including America Chavez and Kamala Khan. 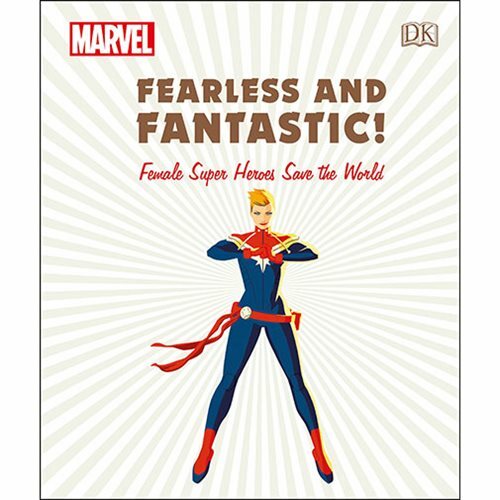 Featuring a foreword by Marvel Comics writer Kelly Thompson, the Marvel Fearless and Fantastic! Female Super Heroes Save the World Hardcover Book is the ultimate tribute to Marvel's most powerful women and girls, and a treasured gift for comic fans. Illustrated with stunning comic-book artwork, and featuring inspiring quotations, each short biography is carefully curated to focus on the character's key abilities and achievements. With four chapters based on personal qualities—Determined, Daring, Compassionate, and Curious—this book for girls and women of all ages will create new fans of comics, as well as inspiring comic-book creators of the future. The 128 page book measures about 9 1/2-inches tall x 8 1/10-inches wide.